I have to be honest, my expectations for The Captain is Dead were pretty low after hearing that it was very similar to Pandemic. Well, let me just say that I’m glad I got a chance to play it. This The Captain is Dead review is based on ~10 games at different player counts. What is The Captain is Dead? 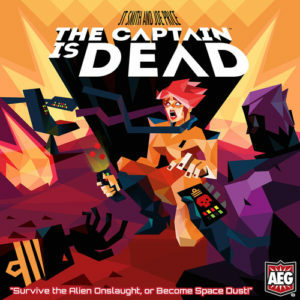 The Captain is Dead is a cooperative strategy board game designed by Joe Price and JT Smith and published by AEG (2017 edition). This AEG version that we’ve been playing is pretty much the same game as the original Game Crafter version, but the components have been upgraded. In The Captain is Dead, you and your teammates are going to be rushing around your ship attempting to hold the aliens off while you fix the ship’s engines (Jump Core). It has similar mechanisms to Pandemic, but it adds in new ways to go about solving the puzzle. Before you start playing The Captain is Dead, everyone will get one of the many characters in the game. Each character card shows how many actions they can do (most have four), their maximum hand size, their skill discounts, and their special abilities. The characters each specialize in one area of the ship, but some of them have abilities that can work in other systems. 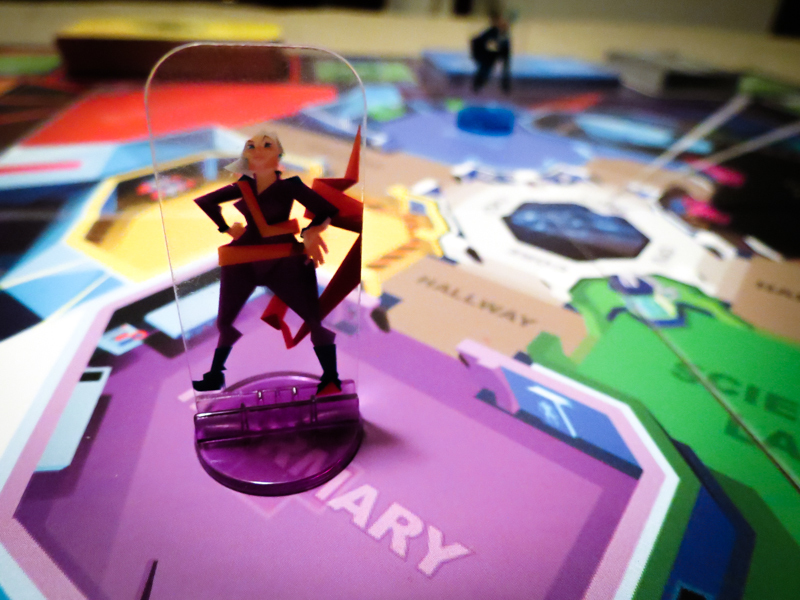 After you’ve put your character’s standee in their starting rooms, you’re pretty much ready to play. Alert cards will be drawn before the game begins, creating the initial chaos, and after every player’s turn. These cards represent the enemy aliens attacking your ship. They can damage or destroy systems, send in ships that increase the rate in which your ship gets hit, or even drop some aliens directly onto the ship. You and your team will be moving from room to room throughout the game. Not only will you be trying to fix what the aliens have broken, you will also be using those systems in a number of ways. The Computers, for example, allow you to draw the skill cards you’ll need to repair systems, research sciences, shoot torpedoes, and, most importantly, fix the Jump Core. The orange Engineering cards that are needed to fix the Jump Core are the toughest to get, so you can’t just focus on that. You will be trying to keep the ship’s shield at a healthy level, and you will also have to keep at least some of the systems online so you can be more efficient each turn. The two systems that you really want to keep online throughout the game are the Comm System and the Teleporter. The Comm System allows you to pass skill cards to other players without having to be in the same room. When the Teleporter is online, you can move to any room on the ship for just one action. We made the mistake of leaving one or both of these systems offline on multiple occasions and lost terribly. All of the aliens make it onto the ship and a card tells you to add more. The shields go offline and the ship gets hit one last time. The Alert deck runs out. As you probably guessed, there is only one way to win. You’ll need to fully repair the Jump Core and get the heck out of there! What makes The Captain is Dead feel different than Pandemic and other similar games are those ship systems. Each one gives the whole team some kind of special ability, and the game changes quite a bit when they go offline. Also, the systems help everyone, and I mean everyone, get into the theme! You can choose from 18 different characters! This definitely adds to the fun and replay value since each character feels very different and you have to strategize based on the ones you get. The Captain is Dead is the good kind of difficult. You know that you could have won a lot of the games you played, but it’s still tough to solve the puzzle since each game is going to play differently. The blocky art style isn’t going to go over well with everyone, but we think it’s really cool. It accurately tells you that the game you’re about to play is both goofy and that it’s going to have a throwback Sci-Fi feel to it. This is the perfect “next step” board game after you’ve gotten used to the great cooperative gateway games out there. It adds just a little bit more complexity to the Pandemic model, which is a great thing since many people don’t want to jump straight into medium or heavyweight games after they’ve played one or two of the popular gateway games. Unfortunately, there can be quarterbacking in this game. Even though you don’t have to show other players your cards, one person could try to take over by telling others what they need to do on their turns. While the plastic standees do look awesome, I worry that they will get all scratched up sooner rather than later. Even just moving the box around or taking them out of their bags could cause damage, but I’m not 100% sure of that… yet. We do not recommend this game if you want to play with two players and don’t want to control more than one character. You only have a few skill discounts with just two characters on the board, making it extremely difficult to keep the systems online and repair the Jump Core. 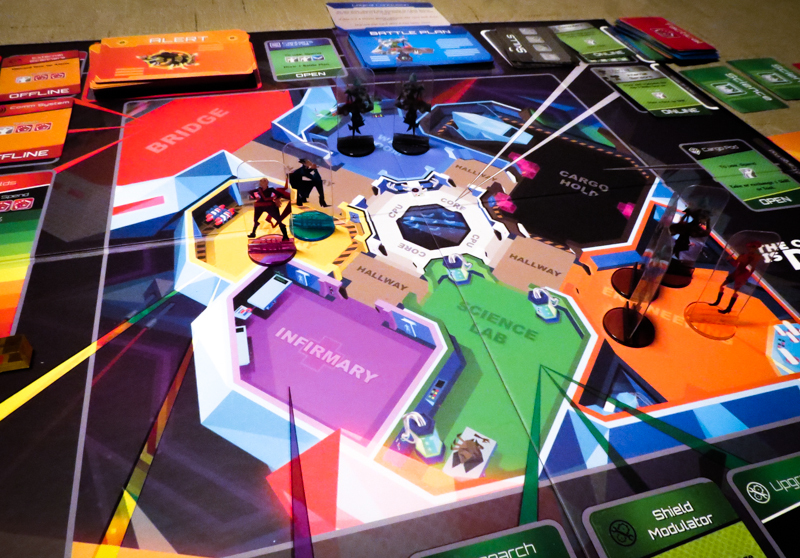 The Captain is Dead has a unique theme and cooperative mechanisms that people will be familiar with. If you’ve gone from Forbidden Island to Pandemic and you’re looking for that next step up, this game would be an excellent choice. Even if you’ve already moved on to more complex games, you should at least test this one out if the theme intrigues you. It is a great challenge and there is plenty of replayability in the base game’s box. Oh, and it’s a great solo game, too, if you don’t mind playing with three or more characters. We’ve had a blast playing The Captain is Dead every time it’s hit the table so far, though we’ve only beaten it a couple of times. This one is definitely staying in the rotation for now. Thanks for taking the time to read our The Captain is Dead review! And thank you to AEG for sending us a copy of this game.